Welcome to Alone Star Jewelry! We are Lisa Johnson Kirkeby and Shauna Johnson Sopel, and we invite you to browse our selections of original designs handmade by us in silver, bronze, leather and various stones and other materials. Back in 2004, Lisa decided she wanted to leave a creative legacy for her sons that followed the example of our father, Jonnie. Dad was an artist who didn't have a lot of time to create, but he taught himself to silversmith, and made conches, belt buckles and rings. He also worked in iron, and was one of the first to design pan rings; he also designed and made wooden tables, toy boxes and beautiful wine racks. Lisa showed me a notebook of drawings she had compiled, and because I was looking for a means of expression too, suggested we jump in together. Lisa was starting from scratch with jewelry but she had designed and sewn clothes for years; I'd learned silversmithing at UT, and Dad left us all his tools. After finding a name that illustrates our goal of being unique, Alone Star Jewelry was born. We have learned much since then, but will learn more as we continue to attend shows, work in the industry, and take classes. We hope you like our work, and if traveling to Austin, stop by the Capitol complex gift shops to see some of our earrings and necklaces. Follow Alone Star Jewelry's board Our Jewelry on Pinterest. 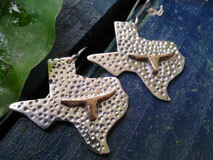 © 2003-2017 Alone Star Jewelry - Texas Handmade Jewelry. All Rights Reserved.